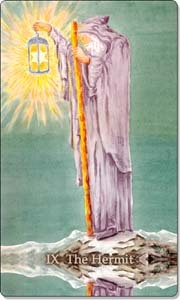 The Hermit is my personality card, and as such I love simplicity and avoid hype, hard sell and pressure. Running a sustainable business or developing a fulfilling career should flow naturally without brute force and the accompanying stress. Thomas J. Leonard in his book The 28 Laws of Attraction has developed a simple system based on Zen philosophy to help you let success flow into your life more effortlessly. When less is more, nothing is everything. Just do what you most enjoy doing. Hidden benefit: You will always over-deliver. Just share what you have with those who express an interest in it. Hidden benefit: Takes the pressure off of wanting other people to see you as valuable or important. Just enjoy what you already have. It’s plenty. Hidden benefit: You will realize how complete your life is already. Just build on your reserves and your needs will disappear. Hidden benefit: Your boundaries will be extended and filled with space. Just respond well to what comes to you. Just let quality sell by itself. Just take the path of least resistance. Hidden benefit: Achievement will become effortless. Just let your body absorb it all on your behalf. Hidden benefit: You will become more receptive to what you need to know in the moment. Just be more of yourself. Just tell the truth and things will change by themselves. This is a summary; you can find the full list of 14 koans on this coaching website. How can you apply the Zen Law of Attraction to progress your business and career life? What improvements to your current working practice can you make? PS: Use the Hermit as a meditation card to explore how you can simplify your working style and accelerate your progress at the same time. Make sure you subscribe to my updates via email or RSS feed to receive the latest content straight into your inbox. Interesting things to think about! I especially like #9 - Become No One. Just be more of yourself. So important. Yes, a tip very much underestimated; too many people try to copy others, who are successful, but most often it doesn't work. What would work for them instead is letting their own uniqueness shine through. Thanks for commenting, Shana!